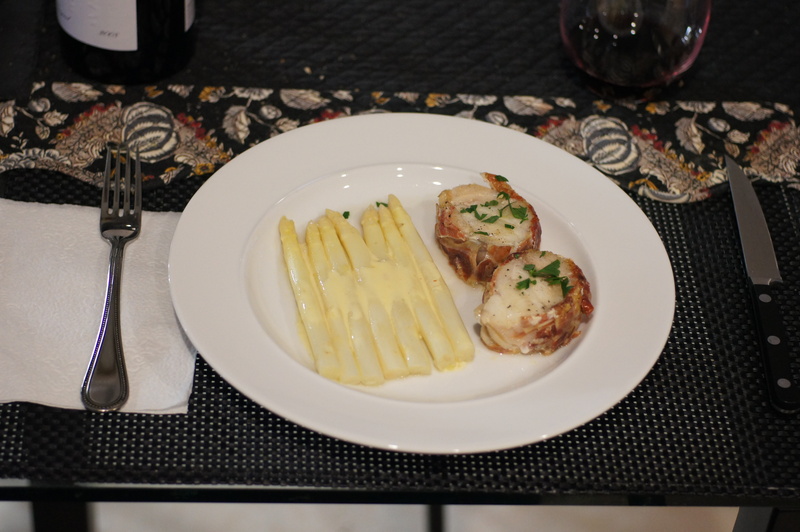 Last might’s dinner was a monkfish wrapped in serrano ham with white asparagus all done sous vide. it was a very light, delicate meal to come from such a grotesque looking fish. Now, the monkfish is known by several different names, i.e. the goosefish, anglerfish, or “all mouth,” appropriately named due to its large gaping mouth. 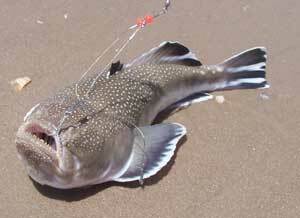 It is a large, ugly, bottom-dwelling fish found in the coastal Atlantic area and can grow up to about three feet. Its body is composed mainly of a huge, gaping mouth with needle-like teeth attached to a muscular tail. Like all anglerfish the monkfish’s spine ends in a flexible, extensible cord which it dangles for use as a fishing lure. When the little fishies are attracted by the “lure” and come to investigate, it opens its large mouth and eats them sashimi style. It really is ugly isn’t it? Because it is mostly head and belly, the only edible portion of the monkfish is its tail. It has a unique, firm-textured, meaty flesh similar to lobster with a mild, sweet flavor. In fact, monkfish is generally known as poor man’s lobster. Of late, however, monkfish has been overfished and it’s not so cheap anymore. Nonetheless, it is a very nice fish that you should try. Wrapping it in serrano ham provides a nice depth of flavor and character to the dish that went beautifully with the white asparagus. Now, wrapping fish with prosciutto has been around for quite sometime, so I didn’t create anything new. The prosciutto provides the salt for the dish and adds a nice depth of flavor while also keeping the fish moist. There are many methods of doing this. You can roast it in butter or olive oil. You can sauté it in a pan over medium low heat. You can slightly brown the prosciutto on all sides and then finish it in the oven. All of these methods run the risk of overcooking the fish trying to get the prosciutto done. Therefore, you need a thicker cut of fish with a dense flesh capable of grilling. This is why I choose monkfish. Also, Monkfish is best cooked with some moisture. While it can be roasted and grilled it has got a tougher texture that some people don’t like. When braised or poached it becomes tender. It also goes nicely with bold marinades, seasonings and sauces. Hence, it’s perfect for sous vide. Here is what we did. Cooking sous vide is not an easy weeknight meal so make sure you set aside some time for preparing this if you are going to do this sous vide. Also, be advised that the asparagus and monkfish cook at greatly different temperature, the asparagus at 85 C and the monkfish at 62 C. So, first thing first, set up the sous vide and set the temperature to 85 C (185 F). While the sous vide is heating the water, take the asparagus and bend the stalk to where it breaks cleanly. Using the broken asparagus as a guide, cut all the asparagus the same length and sprinkle with 2 large pinches of salt. 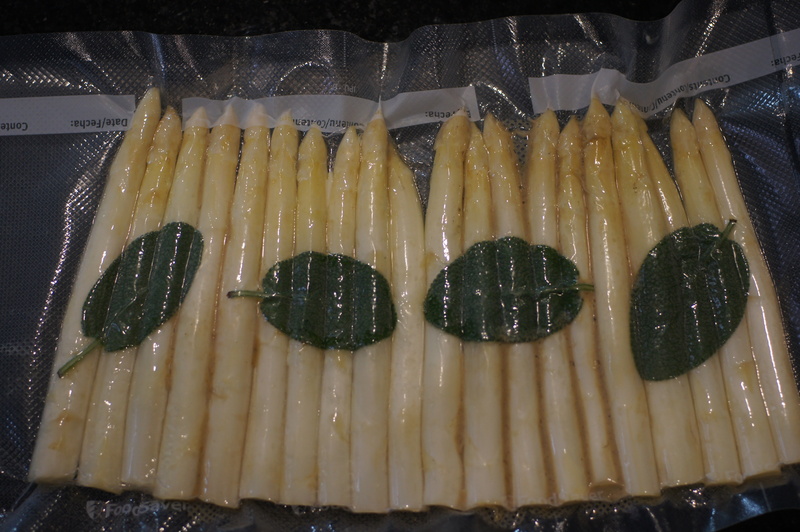 Prepare a vacuum bag and place the asparagus in a line side by side without overlapping. Smear the truffle cream on the asparagus and lay 4 pats of butter on top of the asparagus. Turn the vacuum bag over and place the 4 sage leave on top of the asparagus. Vacuum seal the bag. It will look like this. When the water temperature reaches 85 C (185 F) put the asparagus in the water and cook for 30 minutes. While the asparagus is cooking, prepare the monkfish. 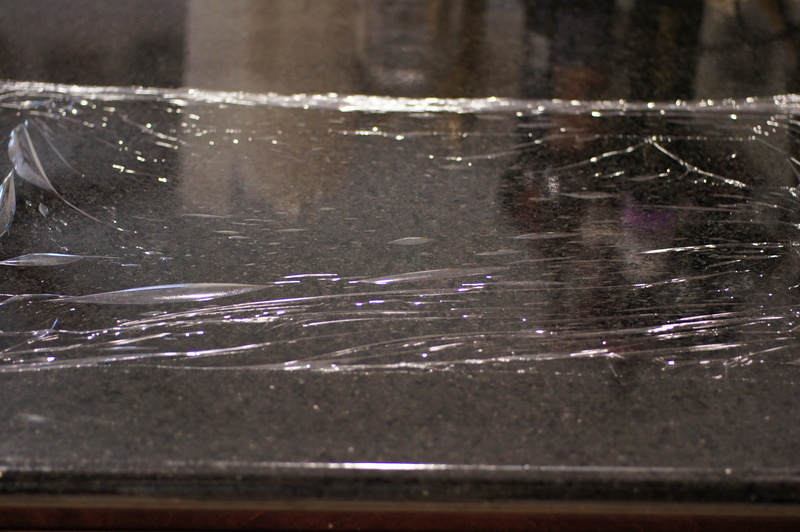 First, wet your countertop with a little water. Lay a sheet of plastic wrap on the counter. 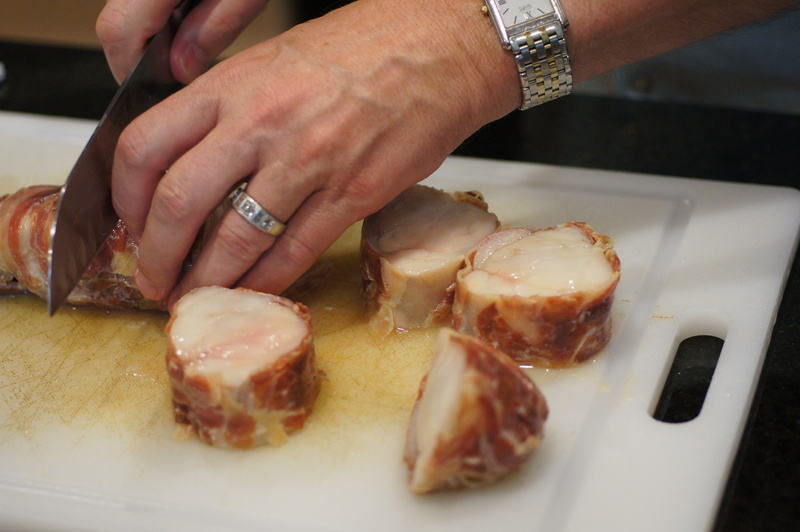 Lay the serrano ham on top of the plastic wrap the length of the monkfish. Notice I did not have long strips so I had to layer the serrano ham. 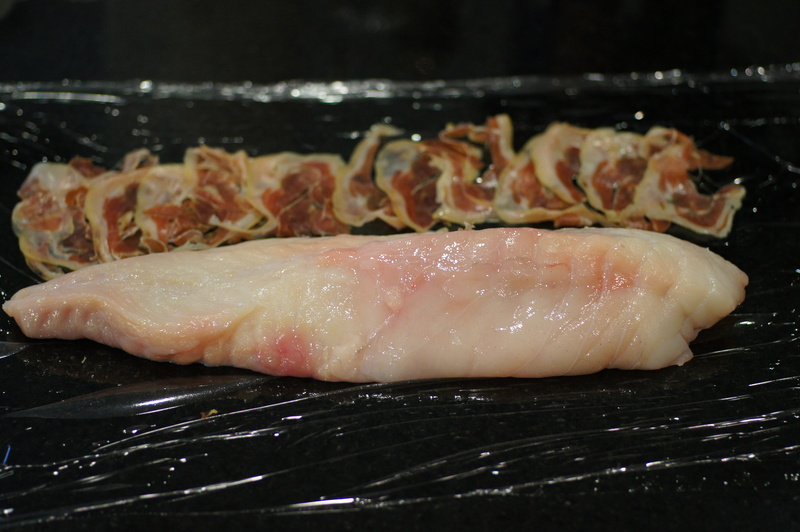 Place the monkfish on top of the serrano ham. Put the remaining serrano ham on top of the monkfish. 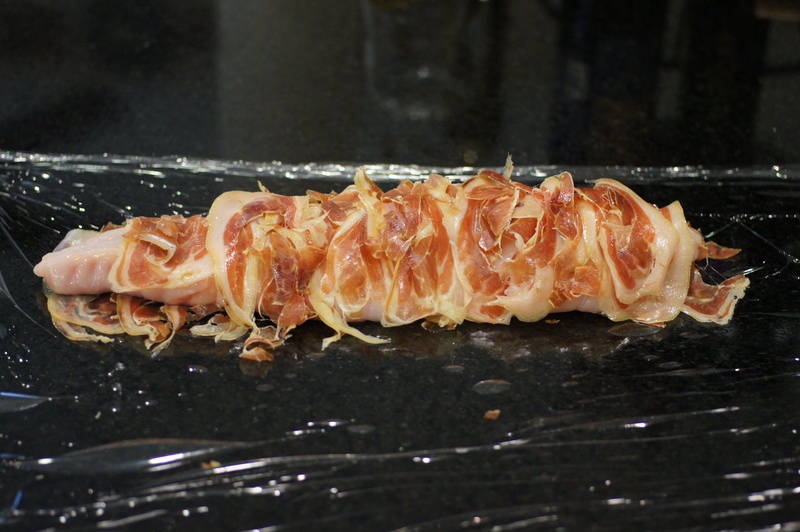 Now, using the plastic wrap, roll the serrano ham around the monkfish. 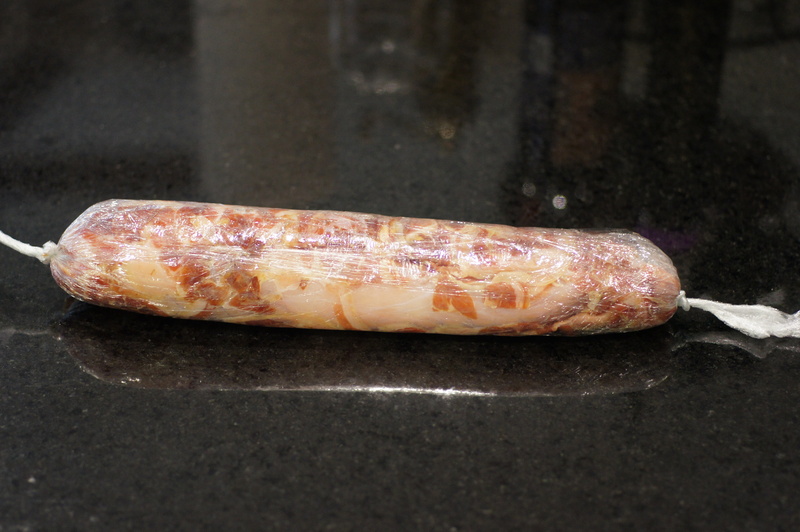 When done, twirl the monkfish tightening the plastic wrap so you have a cylinder of fish wrapped in serrano ham. Tie the ends off. Place in the freezer to firm up for 30 minutes. Partially freezing the monkfish will keep it from becoming flat when you vacuum seal the package. When the asparagus is done remove it from the water bath. Also, replace some of the hot water (in my case I run a 4 gallon water bath so I replaced 1 gallon) with tap water. This will help more rapidly reduce the water bath temperature to 62 C (144 F). When the temperature reaches 62 C, remove the monkfish from the refrigerator and place in the water bath. Cook for 20 minutes. 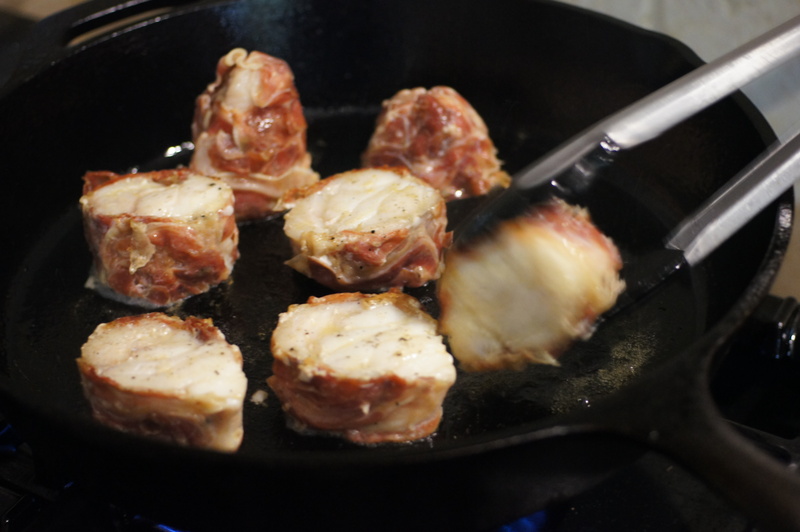 While the monkfish is cooking add the cream and dijon mustard to a small saucepan. 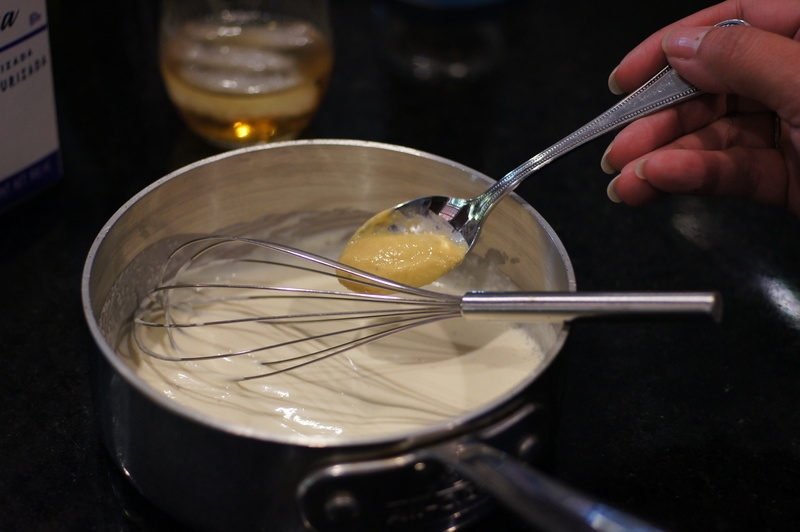 Whisk over low heat for 5 minutes to heat up and reduce slightly. Set aside until ready to serve. At the end of 20 minutes, remove the fish from the water bath. Return the asparagus to the water bath to reach serving temperature. 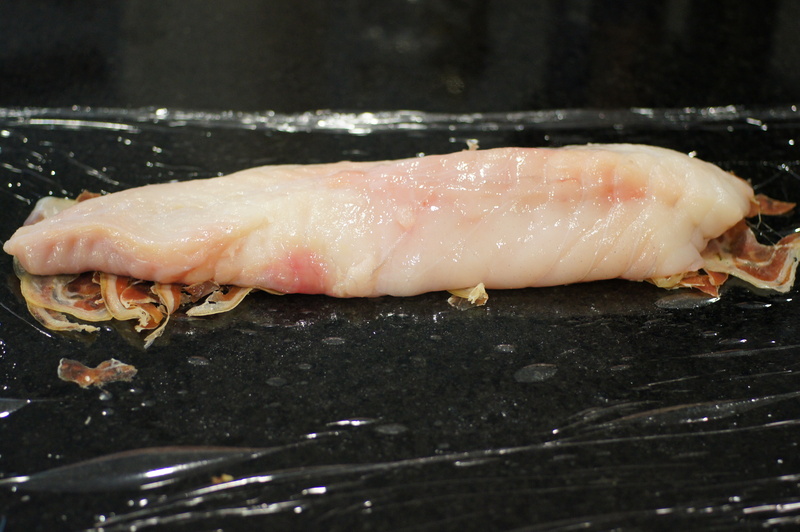 Remove the plastic wrap from the monkfish and cut into 1 inch rounds. Heat a skillet with a light coating of olive oil and crisp the rounds roughly 30 seconds per side. To Plate: Place 2 monkfish rounds on each plate. Place 6 asparagus spears on each plate. Spoon dijon cream sauce on top of asparagus. Garnish with chopped parsley, Serve and enjoy! NOTES: As a side note, should you decide to try this non sous vide you should be aware that fresh monkfish tails have a high moisture content with a milky liquid. It will shrink considerably when cooked. If grilling, roasting, sauteing or pan-frying you will want to remove as much of this moisture as you can before cooking. An easy way to do this is to liberally salt the tail about an hour before you plan to cook it. Make sure to pat it dry before cooking. Hi Richard. Gorgeous techniques right there! Love not only the sous-vide style but asparagus and truffles, delicious. I also love the ballotine of prosciutto wrapped monk fish. Definitely a recipe I would try (if ever) I get one of those fantastic gadgets. We’re definitely on the same foodie wave length. I received a Mollecular gastronomy kit for my birthday some time back and it has a few bells & whistles, but I need more time! I do happen to have sodium alignate though! Thanks for dropping by and your nice comment. The asparagus may have been the best part of the meal. It was stunningly delicious. Great recipe! The sage is also good wrapped in with the monkfish, have you tried that? Have you ever tried the monkfish at 48C/118F? 62C/144F is good, but 48C/118F is even better if you have the right cut of the fish without connective tissue. I’ll be blogging about this soon. I haven’t tried the monkfish at lower temps and am relatively new to sous vide cooking. It’s a very interesting technique and I’m enjoying playing around with it. One of these days I’m going to break down and spend the money on a chamber vacuum sealer because I want to do some of the sous vide recipes with liquids. 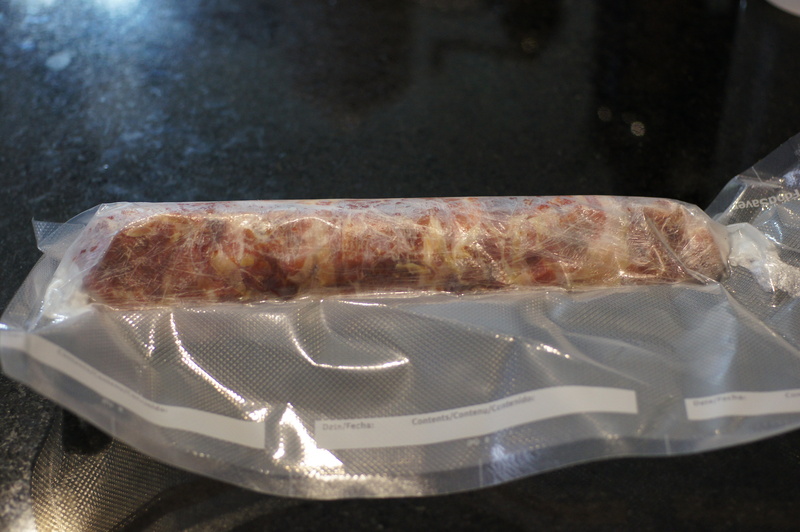 I’ve recently found a dry piston chamber vacuum sealer for the home for under US$600, which is still a little steep but beats the $2500 for a commercial model. I’ve been doing sous-vide with liquids on a regular basis using ziploc pouches. They are $1 each but still cheaper than getting a chamber vacuum sealer! 😀 Very true but there are other molecular gastronomy uses for a vacuum sealer. I haven’t bought one yet but I am looking. I will just have to forego a case of wine. Thanks, Conor. It was a lot of fun and was one of my first attempts with the sous vide setup. It does fish remarkably well and this dish really was killer. Still, the asparagus is what stole the show and it was considerably cheaper than the monkfish, unless, of course, you take into consideration the white truffle cream that was $27 for 2 oz. You only use 1/2 tsp for the asparagus but you still have to have it. Of course, we made a few other dishes once we got it.